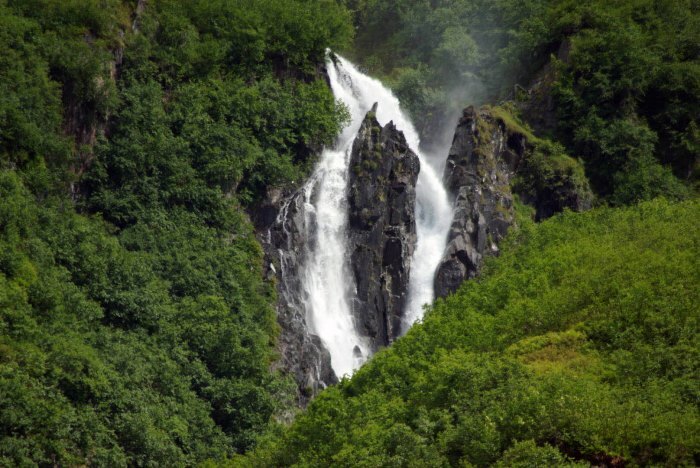 Valdez offers several great hiking trails, most of which begin just a few minutes from downtown. 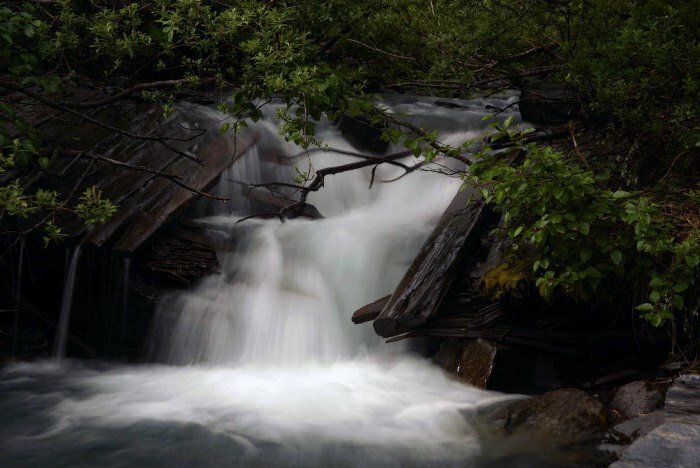 I’d argue that the best of them all is the Mineral Creek Trail, which heads north from town, following an old dirt road through a lush rainforest valley to the ruins of an old mining operation. 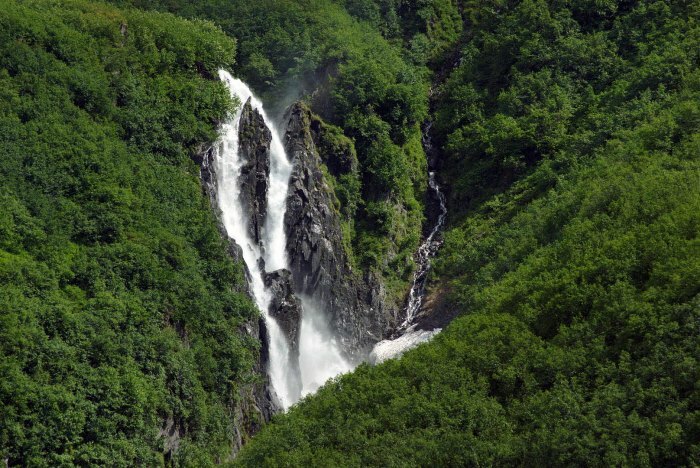 It’s a fairly easy hike that’s simply beautiful — with numerous waterfalls along the way. 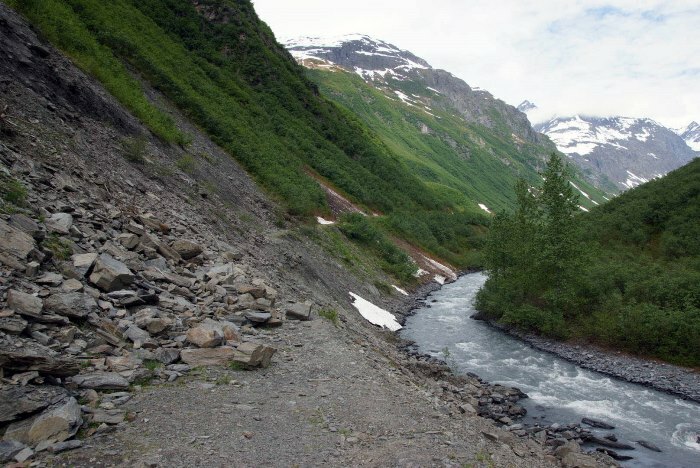 Mineral Creek Trail is located on the north side of Valdez, starting near the water tower. From downtown Valdez, take Hazelet Avenue north, then turn left on Hanagita Street, then right on Mineral Creek Drive. The trail follows Mineral Creek Drive, which goes from pavement to dirt, and continues to deteriorate, the further you go. You can park at the bridge and walk the entire road, or drive as far as you can, and simply park at the side of the road. 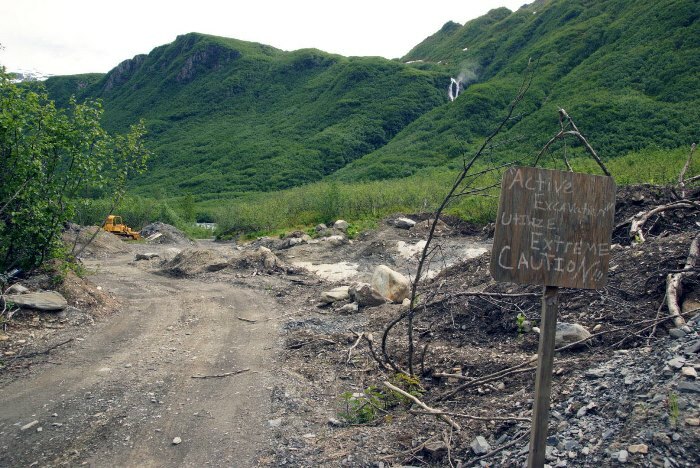 The upper end of the road is blocked by avalanche debris and snow, and vehicles are prohibited on the final mile to the old stamp mill (if you can get that far). 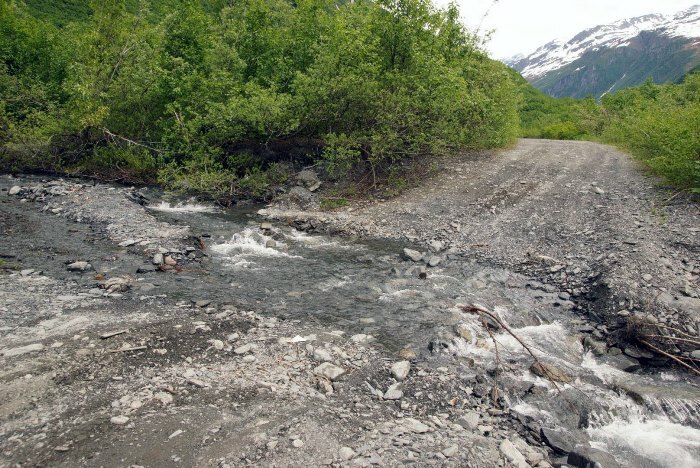 There are at least two or three water crossings that may require a high-clearance vehicle. I decided to make Mineral Creek Trail my first hike of the day. I didn’t want it to be rushed, and I wasn’t sure exactly how long it would take, because I wasn’t sure exactly where I would be starting it. If I had wanted a really long hike (just for the sake of taking a long hike) I could have started walking at my B&B, located a few blocks from Mineral Creek Drive. Or, I could have parked at the bridge over Mineral Creek, and followed the road from there. Instead, I decided to drive as far as I safely could. 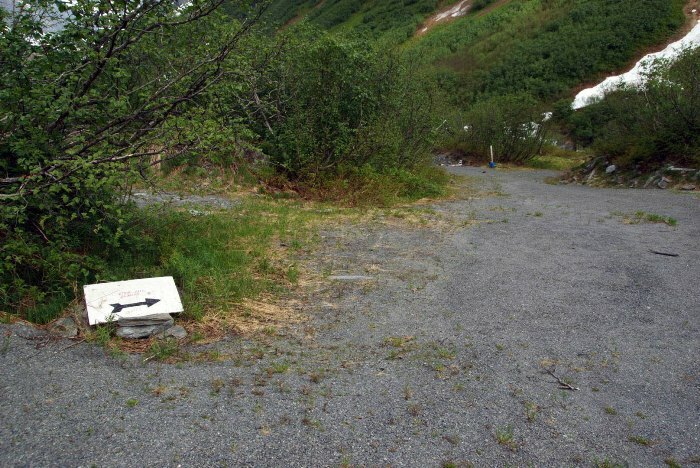 Mineral Creek Drive turns to dirt, soon after you leave the residential area of Valdez, and pass the town’s water tank. 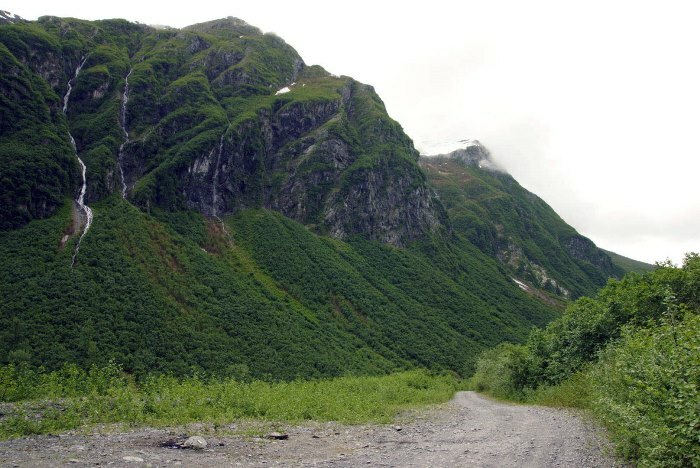 The road gradually gets worse as you drive further up the valley. Take a look at the picture above, and you can get a general idea of where we’re headed. I seriously considered stopping at Horsetail Creek’s waterfall (the first of many along this hike). The creek flows across the road, making the crossing somewhat dangerous for small cars. I had a 4-wheel-drive, so I felt pretty confident about my ability to ford the creek. Also, I didn’t see a good way to cross it on foot, without getting wet. So, I plowed through this one and drove a bit further up the road. Granted, I didn’t have clear blue skies for much of this hike — but you probably won’t either. 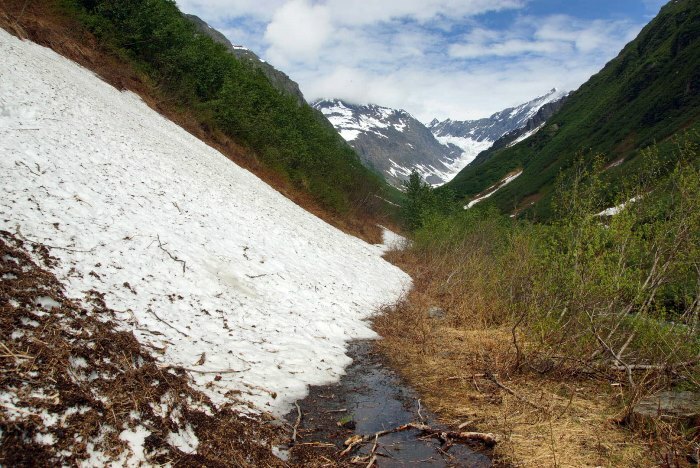 Valdez is notoriously rainy in the summer and snowy in the winter. Most likely, you’ll be hiking in a drizzle, so count yourself lucky if all you have is a cloudy sky. But even with the clouds, the road was already proving to be stunningly beautiful. 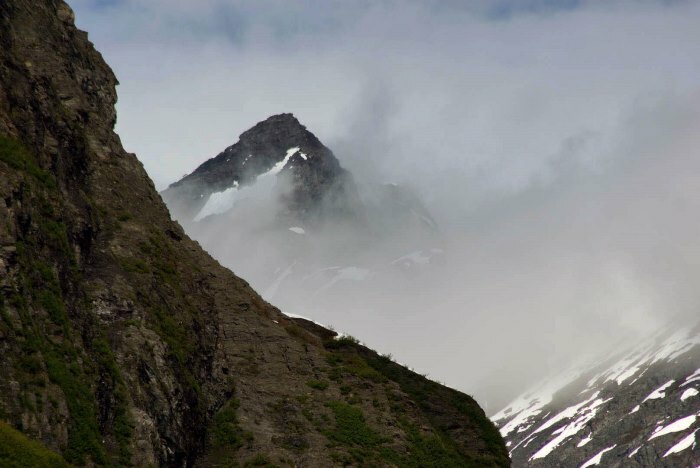 Valdez is in a Pacific temperate rainforest — despite also being in a subarctic climate. 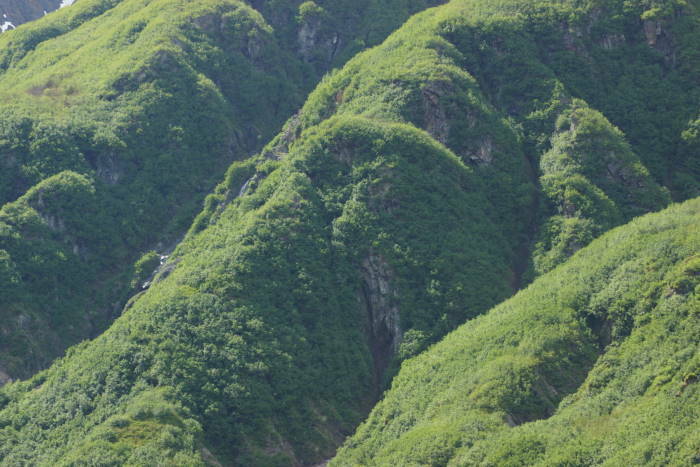 So, these towering cliffs look more like Hawaii than Alaska. … I decided it was time to park my car and start walking. While this creek was easier to cross on foot, it had more sharp rocks, and I worried about driving through it and flattening a tire. So from here, I walked. … although there are places where you can access the water. This spot had a crude sign warning of “excavation in progress”. While I did see some piles of dirt, and perhaps one or two pieces of equipment, I didn’t see anything that looked like it was “in progress”. My map of the trail suggested that, somewhere around here, there used to be a hand tram across the creek that connected to the McIntosh Roadhouse, which has been long since abandoned. I don’t know if I was in the right spot — I didn’t see any evidence of an old building or a tram. I did, however, find a nice little waterfall, a short distance further up the road. A bit further, I discovered why it was a good thing that I had left my car behind. 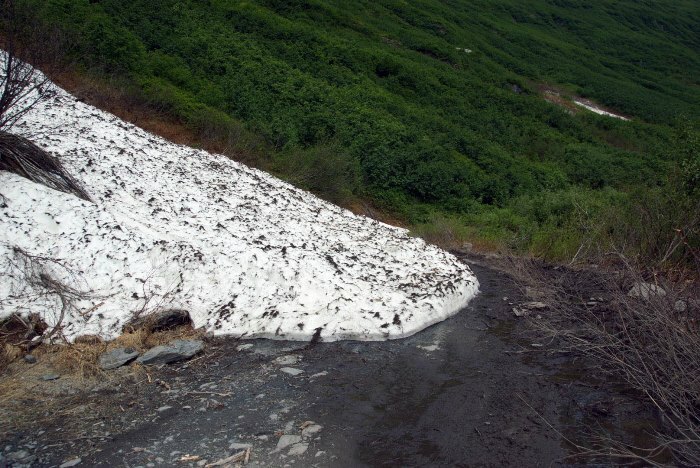 It was the first week of June, but an avalanche of snow still covered the road. 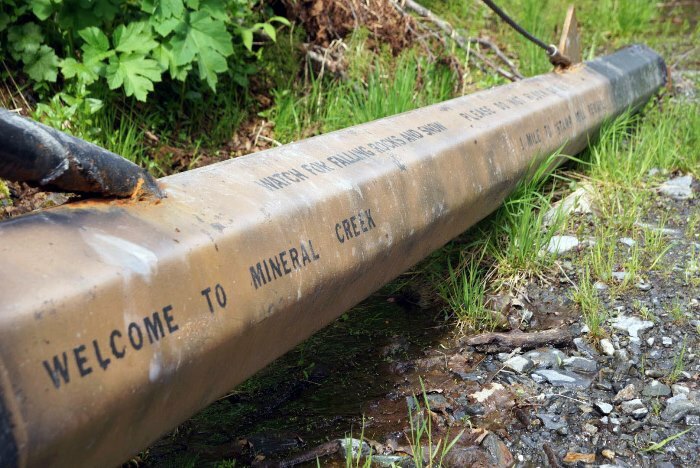 … complete with a gate that probably never moves, and a message welcoming me to the Mineral Creek Trail. From this point, it’s about 8/10 of a mile to the old stamp mill — the hike’s ultimate destination. 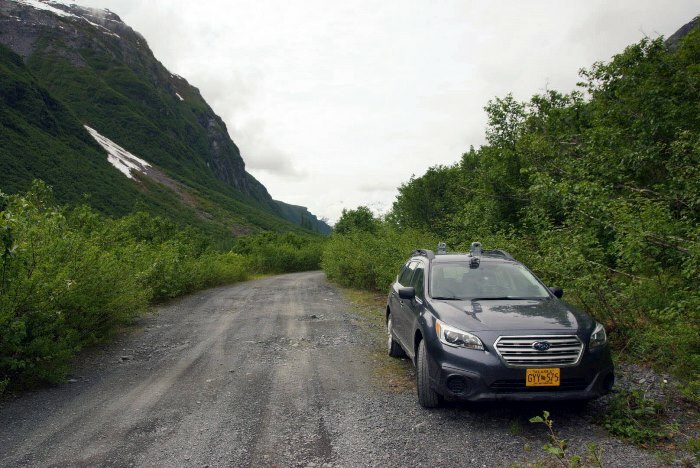 … and the “road” becomes impassable to any kind of vehicle. This landslide area is quite treacherous. If you want to continue, you have to climb over the loose rocks, while being very careful not to slip down the hillside. One wrong move and you’ll tumble towards the creek with nothing to stop you. I safely made it past the landslide, then encountered the next challenge. Another snow avalanche once again covered the trail — but this one required hiking in the snow, in order to pass. I made it over the snow and through the bushes, and then the trail became much easier again. As I approached what appeared to be a very big water crossing, I noticed a couple of arrows pointing towards the right. Without them, it may have taken a while for me to notice, I had reached my destination! 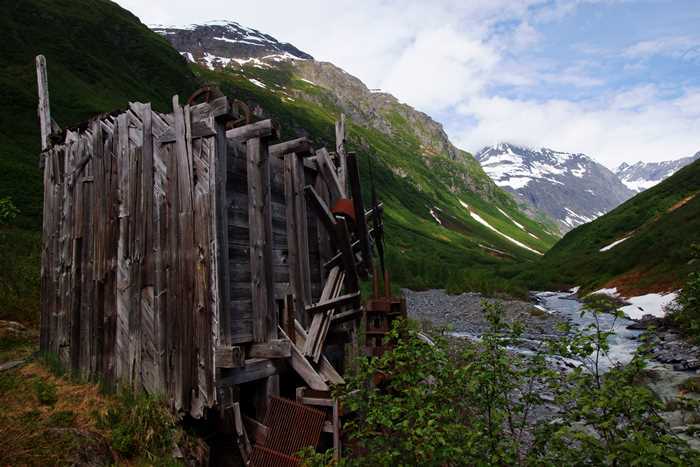 The old stamp mill is hidden from the trail, but once you’ve spotted it, you’ll enjoy a great view of it and the valley! 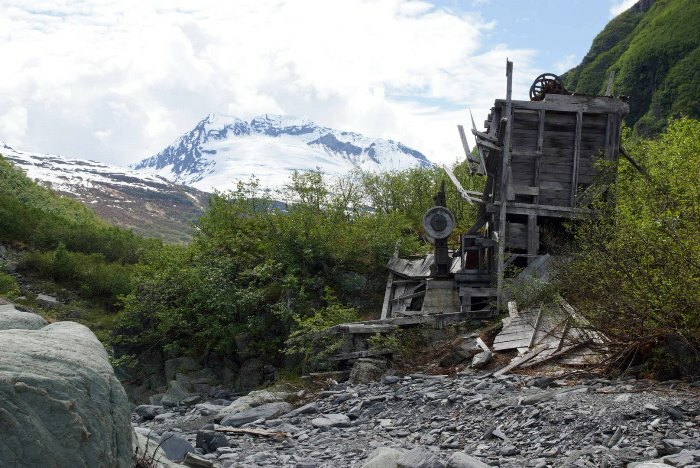 There are no warning signs, and no fences here, so feel free to climb around the old stamp mill and explore. Just keep in mind that it’s very old, and parts of it could be dangerous. The W.L. Smith Stamp Mill was built in 1913. 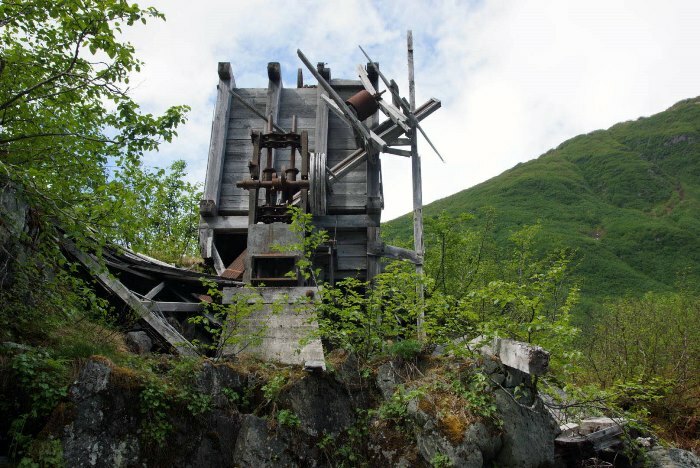 It was used to crush rock from the nearby Mountain King Mine that contained gold ore. The ore was then extracted from the crushed rock using mercury. During its first year of operation, it produced 120 tons of ore.
Remnants of the old operation still litter the ground. 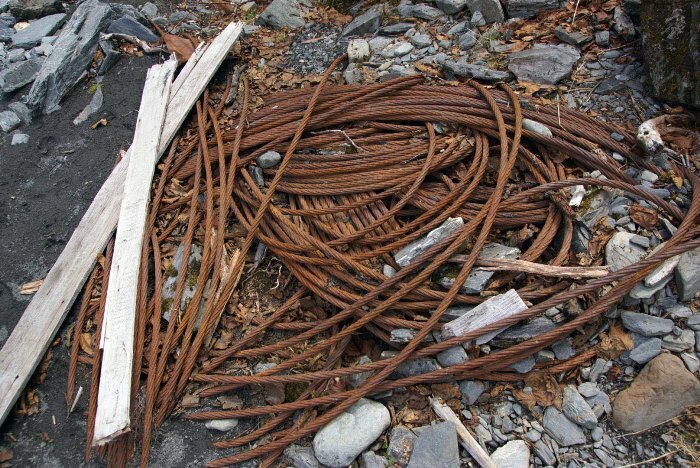 This rusty cable is probably 100 years old! 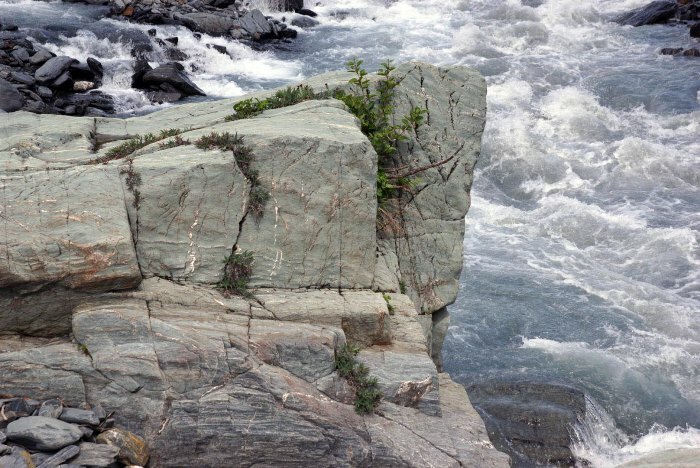 … you’ll also find some big rocks at the edge of the creek, which provide a perfect place to sit and relax for a bit, and enjoy the scenery. I watched as clouds flirted with the mountain peaks to the north. 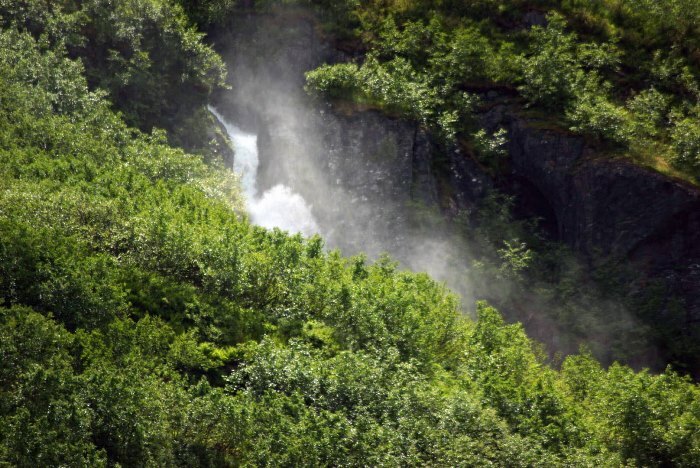 … I paid closer attention to the waterfalls that flow down the surrounding mountainsides. This one kicked up such an intense spray, that at first I thought something was on fire! These waterfalls are all on the opposite side of Mineral Creek, so as far as I know, there is no easy way to access them. That’s a shame, because they truly are remarkable! This valley could be a national park, all by itself. 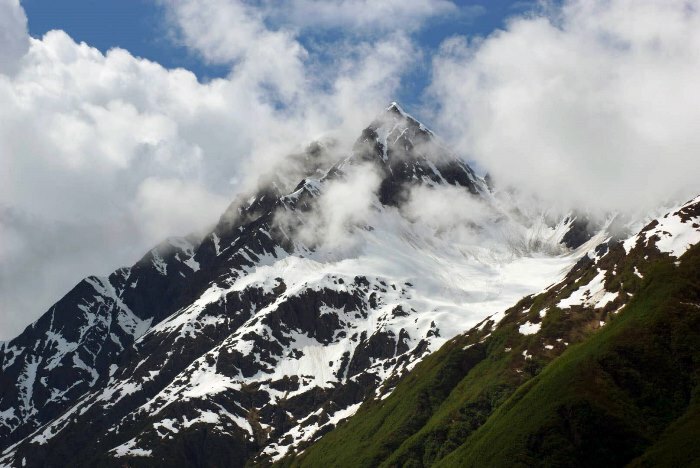 Seeing any blue sky in Valdez at all is quite remarkable. I was truly fortunate to be visiting on such a beautiful day. And look at the slopes of the surrounding hills! 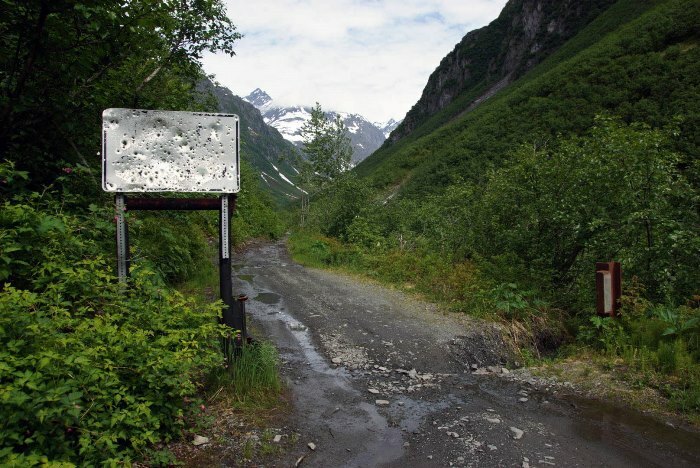 Does that look like Alaska to you? I made it back to the car after about 3 hours, 45 minutes of hiking. If you manage to drive all the way out to the gate, I’d expect your hiking time to be much shorter. But, if you hiked all the way from town (starting at the Mineral Creek Bridge), you should expect the hike to take about 6 hours, and cover about 12 miles. 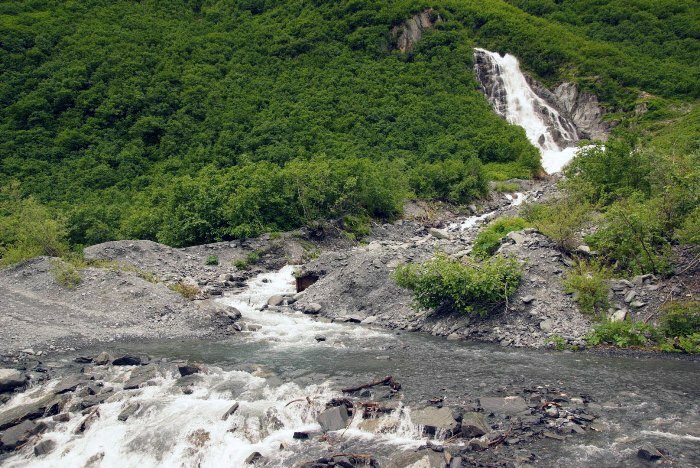 Mineral Creek Trail is probably the best hike in Valdez. I’d suggest driving as far as you can out Mineral Creek Road, in order to make the hike shorter. You’ll still enjoy plenty of nice scenery, without the need for a 12-mile walk.